Update: OK, leaks. You can stop now. Hours after we first brought you news of the potential release of the G2 in Korea as well as an ETradeSupply image, notorious tipster @evleaks released the image you see above, purportedly of the LG G2. 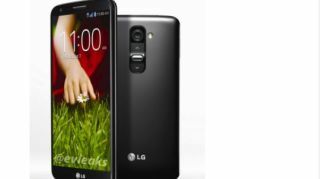 Accompanied by nothing more than "LG G2, 2013" and a link to the photo itself, this looks to be a press shot of the still unrevealed phone. Let's hope Wednesday still holds some surprises. There's one foolproof way to stop the deluge of LG G2 information that has given us plenty of fodder for the phone, yet not the device itself: hold a launch event. That's scheduled to happen tomorrow in New York City. LG is going to unveil its "learning from you" flagship phone, and the device could go on sale right away, at least in its home country. There will be no lag time between the launch event and when stores start selling the G2, according to a report from MK News. The only problem with this report is that LG's home-base is in South Korea, so that doesn't exactly confirm the LG G2 release date anywhere else in the world at the moment. There are only hours to go before the LG G2 is officially unveiled to the world, but the photogenic smartphone made time for one last leak. ETradeSupply is offering a final peek at the phone's LCD display and digitizer assembly. These photos back up the previously rumored display specs that point to a 5.2-inch 1080p screen with very little bezel. The soon-to-be-sorted-out specs also indicate a quad-core Snapdragon 800 processor, 2GB of RAM, and 13-megapixel camera on the back. The chatted-about volume rocker is located on the back of the phone too, right underneath the rear camera. It will be interesting to hear the reasoning behind this odd placement from LG at tomorrow's event, if the feature is indeed finalized. See how rumored iPhone 5S go head-to-head with the iPhone 5.